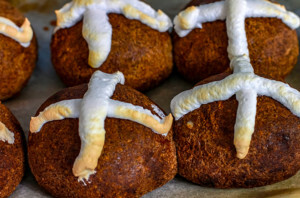 Easter is nearly here and in kitchens and bakeries around the world that means the delicious, spiced scent of hot cross buns baking. For those following a gluten-free diet, a soft, fluffy bun can be hard to come by. Never fear, we’ve called the experts and asked them to share their favourite recipes for gluten-free hot cross buns. We found a combination of gluten-free flours was best able to replicate the texture of a traditional hot cross bun. We’ve used sorghum, brown rice and tapioca in this recipe. Delicious, traditional hot cross buns made with a combination of gluten-free flours. Looking for a hot cross bun that’s free from gluten, dairy and eggs? Casey-Lee Lyons from Live Love Nourish has you covered with this free-from take on the much-loved Easter treat. 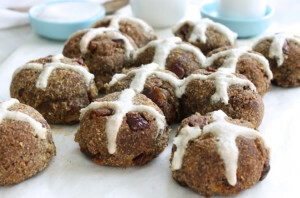 Vegan Gluten-Free Hot Cross Buns From Live Love Nourish. Naturopath and nutritionist Lauren Glucina from Ascension Kitchen uses psyllium husks and grated apple to create raw hot cross buns that retain a similar texture to the baked variety. 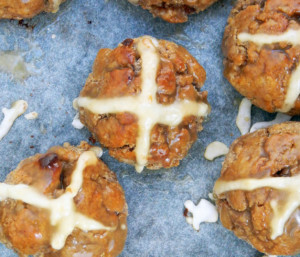 Raw Gluten-Free Hot Cross Buns from Ascension Kitchen. You don’t have to miss out on hot-cross buns just because you’re following the ketogenic diet. 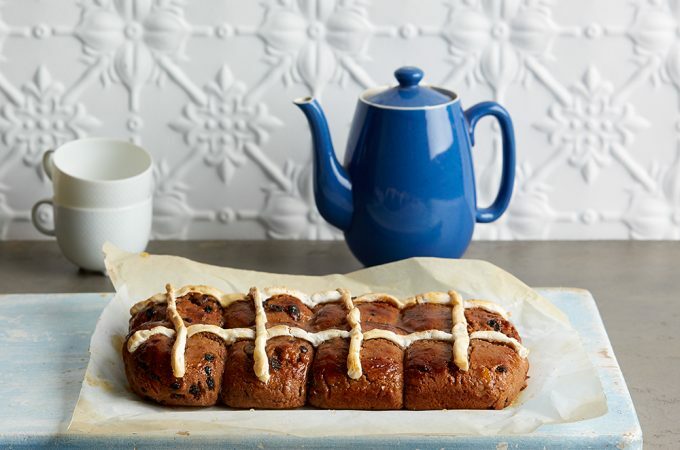 Megan Ellam from Mad Creations has developed a hot-cross bun recipe that’s free from gluten, grains and refined sugars. 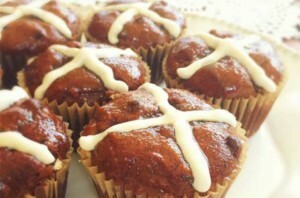 Low-Carb Gluten-Free Hot Cross Buns from Mad Creations. At Australian Gluten-Free Life we love anything with caramel, but we can’t think of a better a better pairing than in this recipe by Lisa McInerney from Mummy Made It. Caramel and Macadamia Gluten-Free Hot Cross Buns from Mummy Made It. If caramel isn’t your thing, don’t worry Lisa also has recipes for Chocolate Orange Hot Cross Buns and for Paleo devotees too. Don’t have time to wait for buns to prove? 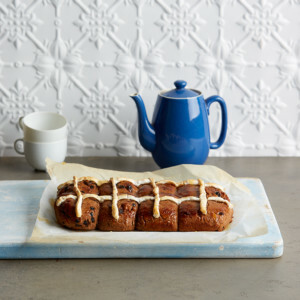 Don’t stress, Vanessa Lee from Becoming Ness has got your back with this recipe for gluten-free hot cross buns made in muffin tins. 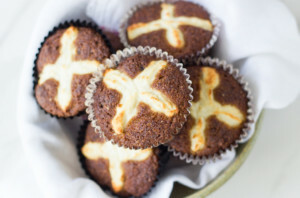 Gluten-Free Hot Cross Muffins from Becoming Ness. This recipe by Jo Whitton from Quirky Cooking is gluten and grain-free and suitable for those following the Gut and Psychology Syndrome (GAPS) Diet. We love the idea of the marshmallow crosses too! GAPS Diet Gluten-Free Hot Cross Muffins from Quirky Cooking. 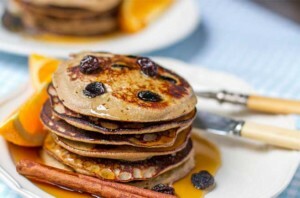 For something different on Easter morning, we’ll be making these paleo pancakes by Irena Macri from Eat, Drink, Paleo. 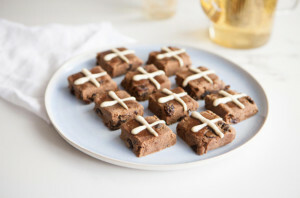 The recipe was inspired by the traditional hot cross bun and they’re super easy to prepare. Gluten-Free Hot Cross Pancakes from Eat, Drink, Paleo.